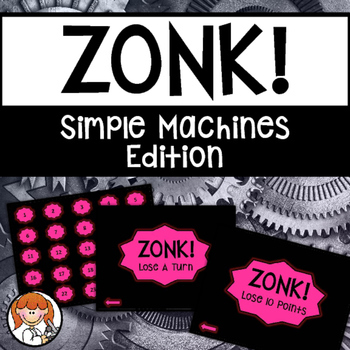 Simple Machines Game - Zonk! Looking for a really fun way to review simple machines with your students? Look no further because this game is SO MUCH FUN!!! 1) Each team will take turns choosing a number. 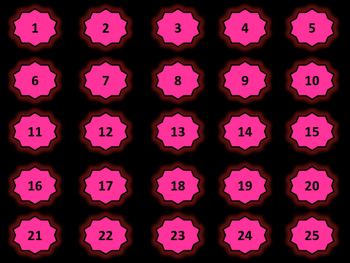 The number can lead to questions worth 5, 10, and 15 points or it can lead to a ZONK or a DOUBLE ZONK. 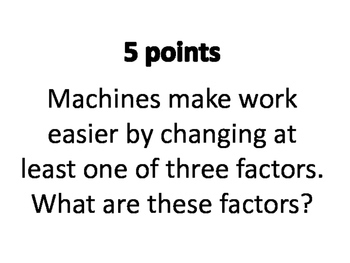 2) If a question appears, the team must answer it correctly to earn the points for that question. 3) If a ZONK appears, the team will lose their turn. 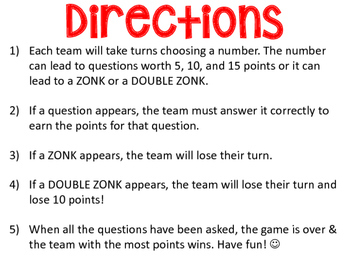 4) If a DOUBLE ZONK appears, the team will lose their turn and lose 10 points! 5) When all the questions have been asked, the game is over & the team with the most points wins. My kids have a blast playing this & I hope yours will too! KG's Shake if Off "Chunky"